A large part of Unexplored Crete, and perhaps the most exciting, is to be found under the surface of the sea! To cross this border and get to know the beautiful landscapes and the inhabitants of the deep, all you need is a snorkel, a mask and a pair of flippers. Of course, if you have a diver’s certificate, you can rent full scuba-diving equipment and explore the underwater world with much more ease and to a greater depth. If you haven’t got a diver’s certificate, Crete is the ideal place to get one. Very many types of fish live in the seas off Crete. Atherina (smelt), gavros (anchovies) and sardines are small fish which live near the surface and move in shoals. You will often encounter them swimming in big shoals near the rocks on the shore. If you see the shoal scattering in panic, it is probably being attacked by a zargana (garpike), a fairly small predator fish that swims near the surface; it has a lance-shaped body and a nose like a miniature swordfish, which you will also meet near the rocks on the shore. If you go out further to somewhat deeper water near to a promontory, or above a shallow reef under which the water is very deep, you may encounter surface fish like the kephalos (grey mullet), a torpedo that moves in small shoals of 10-20 fish, or the gopes (bogue), a very common species forming large slow-moving shoals that are difficult to approach. 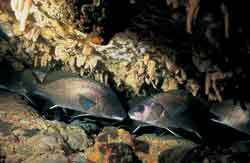 If you are quite observant, you will notice, in the middle of the reef, at a depth of 5-15 metres, both large and small shoals of melanouria (saddled bream), with the characteristic black ring around the base of their tail - looking motionless and indifferent to what is going on around them. If, however, a shoal of synagrides (dentex) appears from the deep, then they disappear in fright under the nearest rock. Synagrides are the queens of the deep, with their impressive colours and noble structure but they have sharp teeth that give away their predatory nature. They go around in small shoals of 5-20 and you will rarely be fortunate enough to see them hunting in the shallows. An even rarer sight is a shoal of magiatika, large migrant fish with a hydrodynamic structure and a shimmering silver colour which appear in the waters of this country at the beginning of spring and stay until the summer. Sometimes they can be more than 50 kilos! Fish like tuna and swordfish live and hunt for their food in much deeper waters in the middle of the open sea; these are big migrant fish that have used the same passages for centuries. Large fish like fagria (sea-bream) and lithrinia (common pandora) live in deep water, more than 50 metres down, in the so-called “benches” (flat areas of the deep with many rocks and seaweed). If you find yourself above a reef or in rocks near the shore which shelve down smoothly to 15-20 metres, forming caves and crevices, swim as quickly as you can and observe the depths carefully to get to know the fish that prefer to live among underwater rocks. If you are lucky (and quite observant), you will see the squat rofos(dusky grouper), the king of rockfish, motionless in front of his hole looking at you with seeming indifference, moving his side fins slowly. But as soon as you go to dive to get near him, he will turn slowly and slip back into his rest, with the calmness and dignity of a king who is, alas, forced to retreat. If you can hold your breath under the water even if only for 20-30 seconds and you know how to equalise the pressure in your ears so as to avoid the painful water pressure, try to notice an underwater dive to a depth where you feel comfortable. Hold on to the underwater rocks and look carefully into the inside of the crevices. If you are lucky, you will see the silver figures made by a shoal of sargos (white sea bream) which sway slowly in the depths of the crevice, some isolated tsipoura (gilt-head sea bream), the golden-yellow reflections of a shoal of sikios, or the antennae and armoured body of a lobster. 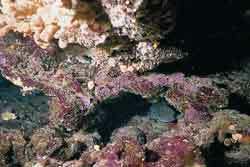 Outside of the rocks, you will certainly see cheiloudes (wrasse), perkes (painted comber), skorpios and many multi-coloured small fish eating tiny morsels of food, and clouds of black microscopic fish (called nuns because of their very black colour) staying suspended near the underwater rocks. You might even see a pair of barbounia (red mullet) searching the waters with their moustaches, a pair of multi-coloured skaros (peacock wrasse) going for a stroll like well-dressed, made-up ladies, or a shoal of mourmoures (striped sea bream) sinking their noses into the sand looking for their favourite worms. Unfortunately, this undersea paradise is threatened by the continually increasing pollution that comes from industrial refuse, ships, oil slicks, pesticides which end up in the sea and much besides. It is also threatened by the overfishing that results from the use of methods which are destructive to the marine environment, like trailing underwater nets. 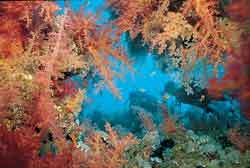 In Greece especially, very great damage is caused to marine life by illegal fishermen who use dynamite, and illegal amateur fishermen (mainly Greeks but also many Italian tourists) who fish with scuba diving equipment day and night. Unfortunately, the picturesque Kalymnos island sponge-divers cause significant damage -they have been more or less out of work since the time the artificial sponge was discovered. For social security reasons, the Greek state has granted them professional fishing licenses and since then, this small professional class has been turned into exterminators of underwater life, using professional automatic scuba diving equipment and spear-guns. The harbour authorities make great efforts to enforce the law, but the means at their disposal are insufficient. But, the law on illegal fishing is strict, is enforced without exceptions and provides for confiscation of vessels and all the equipment used in illegal fishing. Very few species dangerous to man live in Greek seas. Few sharks, usually following ships coming from tropical waters, have been sighted near the shores, and so far, there has been only one shark attack on a swimmer (in Pagasitikos gulf, central Greece). Other dangerous sea creatures are moray-eels (so don’t put your hand into dark crevices), jellyfish, which cause a sharp pain in the area where they sting you, drakenes (small sand- burrowing fish with a poisonous spike on their back that stings bitterly if stepped on), and sea-urchins, whose spikes break off in your body. Of all these, the ones to be most careful of are the sea-urchins because they are everywhere (except on the sand), and if you step or sit on them, their spikes will sink into you and only a doctor will be able to get them out for you.